In keeping with my goal of using vegetables that are in season and, the season being summer, keeping kitchen time to a minimum, I bring you the summer squash. One squash in particular, actually: Zucchini. I’ve been a fan of zucchini ever since I was a kid. No surprise there. It’s what you might call a starter vegetable—easily accessible flavor, slightly crunchy texture, full of moisture. And cooking it is simplicity itself. Kids love ‘em. Moms too. For children, summer squash can be the next step up from potatoes and pasta, the two foods that make up the bulk of all teen and pre-teen calories. You may not wean the kids off the mac and cheese and fries right away, but zucchini is a great place to start because it easily substitutes into a lot of high starch classics. Zucchini lasagna? Fried zucchini sticks? The next great thing about zucchini, something I came to appreciate only after I grew up, is how simple they are. Not only a breeze to cook, they’re fast , no matter what cooking method you use. This goes for all summer squash, actually: crooknecks, patty pans, etc. They’re great off the grill, out of the sauté pan, breaded and baked (or fried), roasted in the oven, etc, etc, etc. They start off so tender they’re even good raw, but cooking really brings out their flavor. Extra flavor is why I started this soup out in a roasting pan (okay, two cookie sheets and a lasagna dish). I lay the squash slices out on the baking sheets in one layer to keep them from steaming, then I sprayed the squash with oil, shook a bit of seasoning on them and roasted them in the oven for 20 minutes. It gave them a better taste and couldn’t have been less labor intensive. The next step was simmering them in stock for 20-30 more minutes, pureeing the soup (a standing or immersion blender again, my favorite), adjusting the seasoning and that was it. Well, almost. For an extra layer of adult interest, I garnished the soup with a healthy pat of goat cheese in the middle of each bowl. The cheese melted into the soup leaving pockets of tangy cream in every bite (as long as you didn’t get greedy). That wasn’t too hard. Easy-peasy, as the kids say. So easy, it might be time to bring the kids into the kitchen and start doing some of this themselves. It may not have the sweet allure of baking cookies or even zucchini bread, but it’s a good place to launch into savory cooking. I’m definitely going to try it with my kids. Wait a minute. It’s summer. Who wants to heat up the kitchen with father-daughter cooking lessons in the middle of June, or worse July? If I put it off ‘til they’re teenagers, the kids’ll be like zucchini themselves—a lot easier to handle and just in need a few finishing touches. 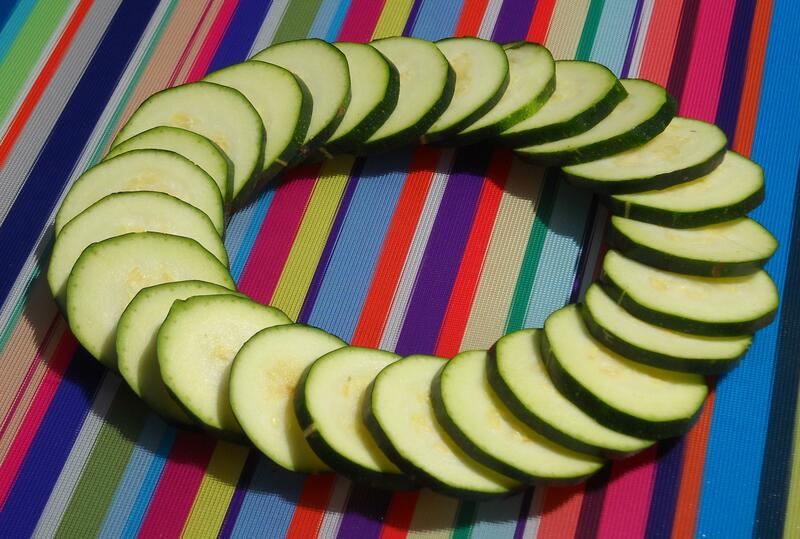 Coat zucchini slices with oil, spread out on a baking pan and roast in a 350 degree oven until soft (15-20 minutes). Add roasted zucchini to the stock, bring to a boil and reduce to a simmer for 20-30 minutes. Puree the soup and adjust the seasoning with salt and pepper. Garnish with an optional slice of goat cheese in the center of the bowl at service. It’s not mandatory, but it is soooo good! It may be hot out, but it’s still okay to leave your thoughts about this posting in the comments section. Don’t worry about me slaving over the hot laptop to respond ASAP. That’s what AC is for. I’ll be reading and responding. By the way, did you get the pasta recipes I sent you? On another note, I’ve temporarily halted my intake of dairy products – has anyone tried making the Corn Chowder with a milk alternative? Almond milk? Soy? I’m worried that the flavor of the substitute will adversely affect the taste as I really, really loved it with the milk… Ah well. Thanks in advance. I did get the pasta recipes you sent. Thanks. We’ve been having a fair amount of heat and humidity punctuated by huge thunderstorms. Weather’s not a bad thing. On the chowder front, I think some of the milks substitutes might work pretty well. As I recall, most of them are pretty sweet, which pairs well with the corn (or clams for that matter). The goal is just to make a nice bechamel. I would try that out first and see how good a roux you can make with margarine. You might want to go classic with the bechamel too: some cloves, onions, a bay leaf and a little nutmeg. It should translate well. Let me know.